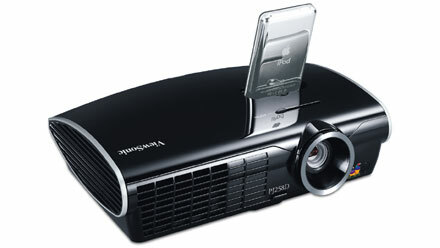 At the 2007 Consumer Electronics Show (CES), ViewSonic today announced the world‚Äôs first High Definition Made for iPod, DLP PJ258D front projector. Mimicking the sleek design of the iPod and weighing less than 4 pounds, the PJ258D lets iPod users bring digital media content to any environment‚Äîfrom living room walls and basements, to well-lit hotel rooms and conference rooms. The PJ258D docking station connects the iPod with video directly to the projector to eliminate the need for a computer to project video content. In addition, it charges the iPod‚Äôs battery while digital content is being played to make hours of entertainment possible. The projector also supports other popular digital media through its multiple connectivity options, including S-Video and VGA, which enable users to quickly connect to PCs, DVD players and video game consoles. Built on Texas Instruments‚Äô DLP platform, the PJ258D boasts a 1024×768 XGA resolution, 2,000 lumens of brightness and a 2000:1 contrast ratio to deliver bright, crisp pictures and video playback in any setting. The PJ258D will be available in Q1 through authorized ViewSonic professional audio-visual resellers, distributors and solution providers for an estimated street price of $999. I feel that the sound of my new i-pod video projector is not loud at all. Is it that I did something wrong? Do I need to buy a speaker? I need to project video from my i-pod to my class! I’m a teacher. Thanks for answering!